It seems like this 15W is only on paper, for marketing purpose. It’s called „impulse”, and we should be able to get peak power of impulse around 15W. Continuous power is 8W. 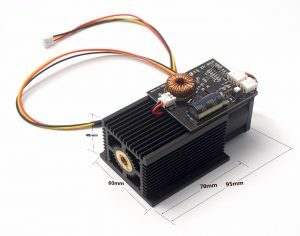 I’ve ordered also module with fixed focus, not adjustable, since this type should offer better power transfer. Not so long ago I’ve managed to corrupt my bootloader in woodpecker board by silly mistake. I’ve downloaded binary firmware (to back it up) with chosen ATmega2560 instead of ATmega328P – since it has more memory, dump was too big to fit later in 328p and when I wanted to restore it, I’ve overwritten bootloader. Interesting thing – firmware was still working ok. Anyway since I anyway wanted to upload newer bootloader no harm done. Just needed to find proper way to connect to the board.